Publisher’s Note: The following email was received from Altoona Curve General Manager, Rob Egan. 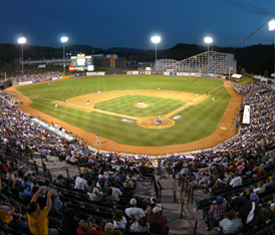 The Altoona Curve are the AA Minor League Baseball Affiliate of the Pittsburgh Pirates, and a member of the Huntingdon County Visitors Bureau. If you’ve never been to a Curve game, it is worth the experience, if only to see the ballpark with the wooden roller coaster as a backdrop behind the right field wall. The Curve consistently have had award-winning, in-game entertainment, and provide a MiLB experience like no other. We want to thank you for a successful 2012 season. There have been so many positives over the course of the past nine months that helped us prepare for and celebrate our 14th season of Curve Baseball. We are truly blessed to have such tremendous support of our franchise from all of you. The Curve ownership, management, front office staff, coaches, players, and game day employees aim to repay that trust every day by giving you great value when you come to a ballgame or event. In addition, we’re constantly looking for ways to give back to the community through our charitable efforts inside and outside of the ballpark. We are extremely proud of these accomplishments and highlights which are made possible, in large part, by your continuing support. So, again, on behalf of the Curve, thank you for a successful 2012. While we just completed this past season, we are eagerly preparing for our 15th year which will include the March 30, 2013 exhibition game with the playoff-hopeful Pittsburgh Pirates. We hope that you will continue to be a big part of making it all happen! CURVE, Pa. – Pittsburgh Steelers’ Pro Bowl wide receiver/kick returner Antonio Brown and Pittsburgh Penguins’ All-Star left wing James Neal will appear at Peoples Natural Gas Field during the 2012 season as part of the Altoona Curve promotional schedule. Brown will make his way to Curve, Pa. on Friday, April 6th when the Curve play Erie as part of a big opening weekend, thanks to Peoples Natural Gas. 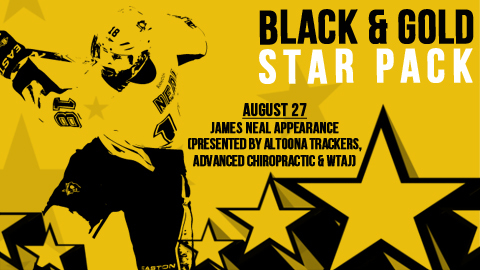 Neal visits Altoona on Monday, August 27th for the Curve vs. Akron contest courtesy of the Altoona Trackers and Advanced Chiropractic. Both Brown and Neal will take part in pre-game festivities and sign autographs for fans during the game. WTAJ-TV will be the media sponsor for both of the appearances. Brown, 23, played in all 16 regular season games for the Pittsburgh Steelers in 2011 while going over the 1000-yard receiving mark for the first time in his short, two-year career. The Florida native was selected to his first Pro Bowl after the just-completed 2011 season, going in as a kick returner after averaging 27.3 yards/kick return and 10.8 yards/punt return (one for a touchdown). Brown was selected by the Steelers in the sixth round of the 2010 NFL Draft out of Central Michigan and played in nine games during his rookie season. He capped off his first year as a pro with a couple of key catches during the playoffs that helped the Steelers make Super Bowl XLV: a 58-yard snag to help set up the winning score vs. Baltimore in the divisional round and a clutch, 14-yard grab to assure the win over the New York Jets in the AFC Championship game. Neal, 24, has scored 30 goals and racked up 57 points through 59 games played this season as the top-line left wing for the Penguins. A second round selection by the Dallas Stars in 2005, Neal came to Pittsburgh by way of a trade during the 2010-11 season when he was swapped along with Matt Niskanen to the Penguins in exchange for Alex Goligoski. The Ontario native’s 30 goals this season are a career-high in his four years in the NHL and he has exceeded the 20-goal plateau in each of his first four campaigns. Of his 30 goals this season, 13 have come on power play opportunities, tying him for the league lead in that category entering play on Monday. This past weekend, Neal signed a six-year, $30 million contract extension with the ‘Pens that prevented him from becoming a restricted free agent on July 1st. The pair of appearances by the stars from the Steel City headlines a special, five-game ticket plan for 2012 that the Curve are dubbing the Black & Gold Star Pack. Also included in the five-game plan are two giveaway nights and the Fourth of July Fireworks Night presented by the Pennsylvania Lottery. Keeping with the theme of Black & Gold stars, two of the other games in the plan are centered on up-and-coming players in the Pirates’ minor league system that will hopefully make it to Pittsburgh in the near future. Fans will get to attend the Starling Marte Canvas Painting Giveaway Night presented by Holiday Inn Express (first 1,000 fans) on Friday, May 4 and the Gerrit Cole Fireball Giveaway presented by UniFirst (first 1,000 fans) on July 20th. Marte won the Eastern League Rookie of the Year award and the league batting title in 2011 en route to his most productive season in the minors. Cole was the first-overall pick in last spring’s draft out of UCLA and could make his way to Altoona at some point during the upcoming 2012 season. Fans can purchase the Black & Gold Star Pack with the five games mentioned above for as low as $30 for a Grandstand seat. The ticket plans, which are on sale now, are also available in Rail King, Diamond Club, and Terrace levels. Altoona opens its 14th season of baseball at 6:30 p.m. on April 5th as they welcome in the Erie SeaWolves (AA – Tigers) to Peoples Natural Gas Field. Individual game tickets for the 2012 season will go on sale beginning March 9th at Baseball Bash, which takes place from 5:30-8 p.m. at Peoples Natural Gas Field. For more information, please call 877.99.CURVE, visit www.AltoonaCurve.com or stop by the offices at Peoples Natural Gas Field during normal business hours.